KING PIN BEARINGS - STAINLESS STEEL POLISHED ..
KING PIN CAPS - STAINLESS STEEL - POLISHED ..
KING PIN SET - 37 TO 41 FORD ..
KING PIN SET - 42 TO 48 FORD ..
COMMODORE RACK & PINION fully rebuilt & shortened to suit HK-HT front ends CHANGE..
PITMAN ARM HQ -- S/STEEL POLISHED 125MM C-C ..
PITMAN ARM HQ -- S/STEEL UNPOLISHED ..
COMMODORE RACK & PINION fully rebuilt & shortened to suit HR front ends CHANGE O..
COMMODORE RACK & PINION RACK MOUNTING BRACKETS & BOLT KIT UNIVERSAL FIT FOR HOLDEN F..
COMMODORE RACK & PINION - ADJUSTERS ONLY - ADAPTS SHORTENED RACK TO HR-HT TIE ROD ENDS ..
BORGESON UNIVERSAL JOINT - S/S POLISHED - FULL RANGE OF SIZES AVAILABLE (specify size) ..
BORGESON UNIVERSAL JOINT - STEEL - FULL RANGE OF SIZES AVAILABLE (specify size) Si.. STEERING STOPS - STAINLESS STEEL - POLISHED .. STEERING ARMS - BOLT ON STAINLESS STEEL - POLISHED - SUITS 37-48 STUBS/ROD-TECH STUBS .. STEERING ARMS - CROSS STEER - MILD STEEL - FLAME CUT- LONG - SUIT 37-48 STUBS*****NO LONGER AVAIL.. STEERING ARMS - CROSS STEER - MILD STEEL - FLAME CUT- SHORT - SUIT 37-48 STUBS***NO LONGER AVAILA.. 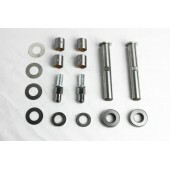 STEERING ARMS - BOLT ON STAINLESS STEEL UNPOLISHED,SUITS 37-48 STUBS/ROD TECH STUBS .. STEERING ARMS - PUSH - PULL MILD STEEL FLAME CUT - SUITS ROD -TECH STUBS******NO LONGER AVAI.. STEERING ARMS - PUSH-PULL MILD STEEL FLAME CUT TO SUIT ORIGINAL FORD 37-41 STUB*****NO LONGER AVA..